In place of resolutions I like to spend the first few weeks of every new year making space for reflection, meditation, and being still. Reflecting on the lessons learned from the previous year and all of my accomplishments, meditating on what I’m thankful for, counting my blessings, and of course caring for myself. I apply these sentiments to my personal and professional life which includes 540WMain Communiversity. Join me for a quick month by month look back at the past year and a glimpse of what you can expect from 540 in 2019. 540’s theme for 2018 was Sustainability. As leader I wanted to be purposeful in the personal projects I took on as well as how I steered the organization. Before doing anything I asked one simple question: Will this make 540 sustainable? January saw the beginning of our now annual Fit, Well and Sustainable Campaign sponsored with Getting It Done Fitness. 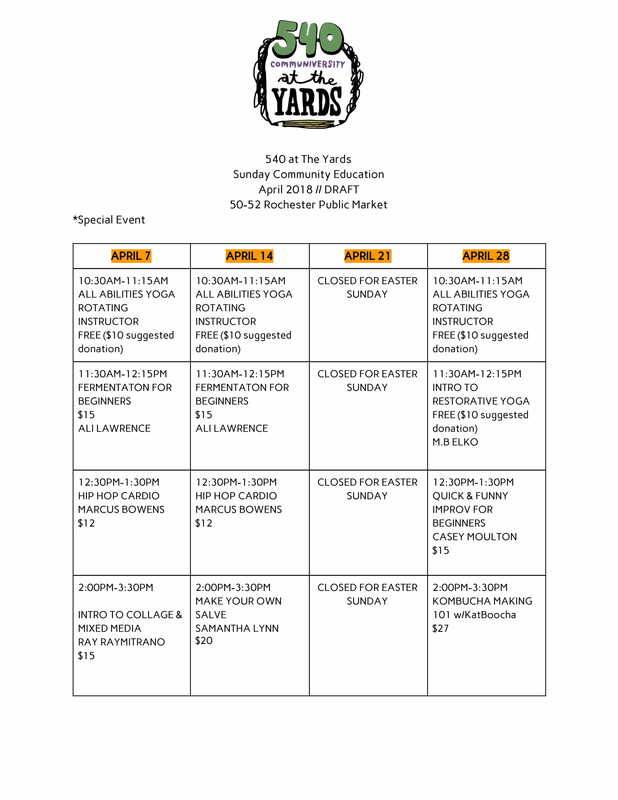 This campaign saw us curate more classes rooted in physical, mental, and spiritual wellness. You also began to see more classes being held offsite in the community. There was a panel with Rachel Barnhart’s Rochester for All, and Metro Justice started to use the Community Room for it’s monthly education meetings. Additionally, we hired Mercedes Phelan as Community Activist Liaison, introduced Conversations in A Community Room, sold out Intersectional Feminism, and 540 took continued to work with (and pay) Minnie Lopez one for the four high school interns that started with us in the summer of 2017. In February new classes centered on Black identity were introduced including Black History Didn’t Begin With Slavery, Mental Heath Disparities in the Black Community, and Sugar Addiction in the Black Community. We also collaborated with Imani Olear’s Yoga for A Good Hood. On 540Blog we launched 28 Days of Little Known Facts About Black American History. 540 continued its commitment supporting makers and small business owners. The Makers Market expanded to included small businesses as well like Theresa Sloan, Ashley Wright and more. 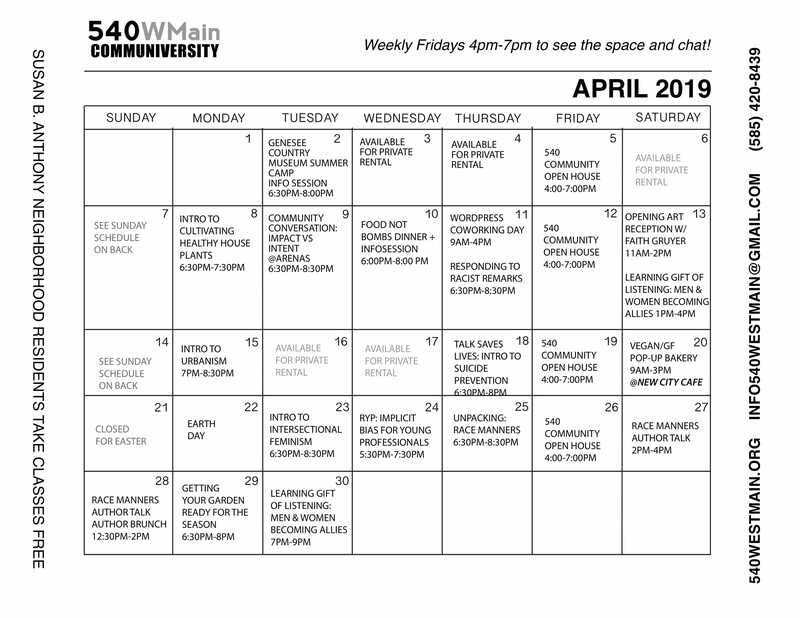 540 also launched the inaugural Gentrification Conference held at Beechwood’s 441 Ministries, had it’s first online class, and launched the classes Intro to Grant Writing and DIY Henna for Beginners. 540Blog really began heating up with posts from our year long Featured Blogger Erin Egloff who also sits on 540’s advistory board. We introduced the new class Intro to Gentrification. Continued many amazing classes and hired Community Organizer Jake Sell Hicks. In the digital community 540 started creating content on Twitter. The sustainable growth continued as 540 received its first ever grant courtesy RocGrowth and hired a third part-time employee; Advertising and Social Media Associate. We celebrated the 2nd Annual Black Women Roc campaign, introduced Tried an True classes, and Introduced the Unpacking™ Book Discussion series. 540’s 2019 theme is Purposeful Collaboration the greatest of which includes 540 at The Yards which begins in Febrary. We kicked off this year collaborating with Flexx Mobility and Performance, LLC with the 2nd Annual Fit, Well, and Sustainable at 540 Campaign and so much more to come. I cannot wait to share more announcements and collaborations with you as we continue through January and look forward to your continued support throughout 2019.